On your special day, give your friends and family a symbol of the love you feel for them with these heart design candle favors. 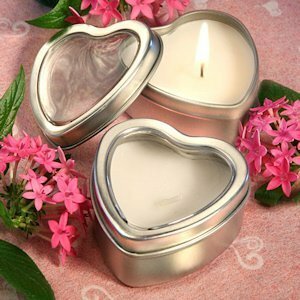 Each candle tin favor measures 2 1/4" x 1 1/4" x 1" and is made of brushed silver metal in a two piece - base and cover - heart shape with a poured white vanilla-scented candle inside. At the center of the cover is a clear plastic window that reveals the candle inside and also makes a great place for a personalized label or tag. Are your candles made with soy wax? The wax used in our candles is made from Palm Oil. I would need one hundred of these how many should i order exactly? Do you offer samples to see if I wanted to order these in bulk? Yes, you can just order 1 favor on our site. Both the item and shipping costs are discounted for our samples (1 favor).